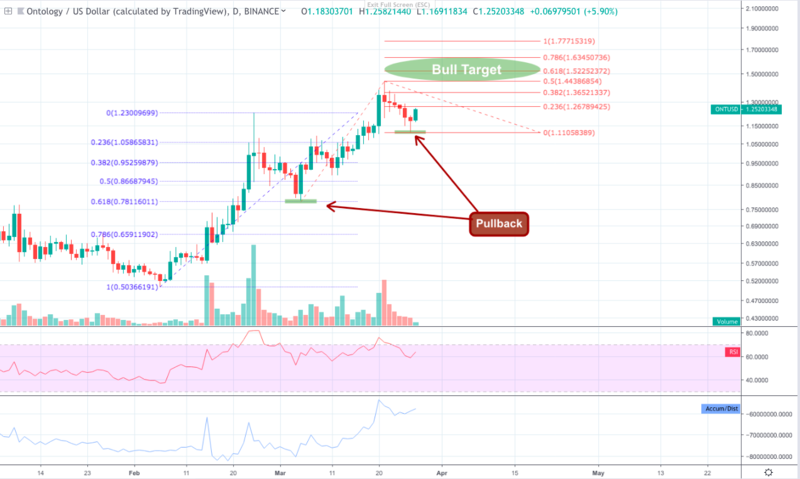 Ontology (ONT) Technical Analysis: Bulls Looks Ready to Move Again. Is Now a Good Time to Buy? Ontology has been one of the best performing top 50 crypto assets this month, banking a 58% gain from $0.91 to its recent 2019 high at $1.44. Overall, ONT has managed to surge 147% since the new year and claw back a vast majority of its ground lost during the November bear market last year. The recent streak of bullish momentum appears to have been catalysed by the new Ontology partnership announcement with Korean content streaming platform, Moviebloc. According to the official post, Moviebloc is ‘a new participant-centric film distribution platform’ that plans to leverage Ontology’s blockchain infrastructure to build their content sharing ecosystem, and in return will receive marketing, capital, and operational advice from Ontology’s team. Also in the news this month, Ontology have organised a 50,000,000 TOP token airdrop to celebrate the Top Network becoming the first token listed on Huobi Prime. Top Network is an Ontology incubated blockchain startup that aims to create a full decentralized suite of cloud communication services for businesses. The TOP token IEO on March 22 was a huge success, and since then the asset has gone on to surge over 225%. On the 1D ONT/USD chart, the asset has been uptrending consistently over the last 50 days with two significant impulse movements intersected with two brief pullbacks. 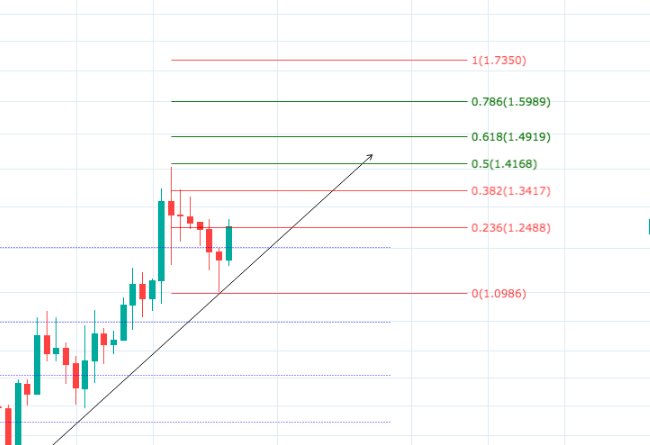 Using the fibonacci retracement tool, we can see that the first pullback fell exactly on to the 0.618 level ($0.76) before the second impulse movement began. 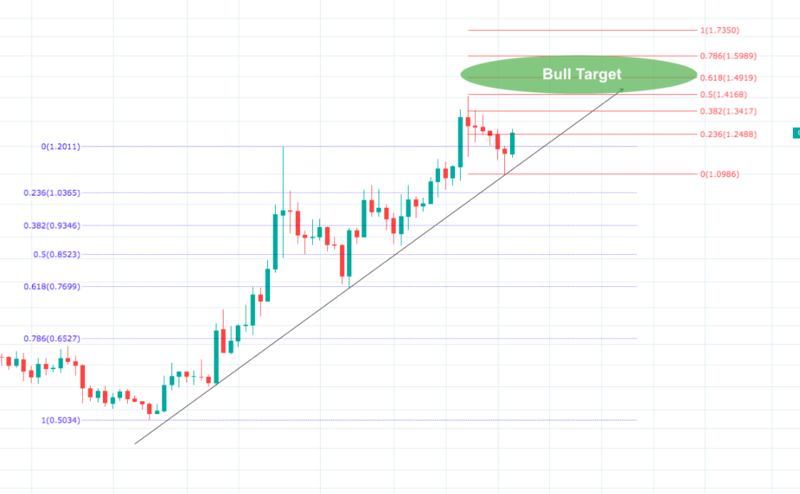 By drawing a fibonacci extension from this new swing low to the current swing high at the top of the second impulse leg, and then down to the second pullback we can get a good idea of where the next bull run might peak. The last two impulse movements lasted for 18 days and 16 days respectively, before correcting. The percentage gains of the two impulse movements has also been decreasing which suggests bullish momentum is starting to peter out and that ONT may start transitioning towards a bearish trend correction soon. Following this pattern, we could see the current uptrend terminate over the next 12-14 days and peak anywhere between the 0.5 and 0.786 fib extension levels ($1.41 and $1.59 respectively). From here we would expect the overall bull run to finish and for bearish traders to regain control of the market. The strong uptrending support that ONT has been tracking along perfectly since the bull run started, should provide a good indicator of when the bears have arrived. If candles begin to close beneath this line then it is likely a sign that bulls have become exhausted, and that a bearish phase will ensue. All ROIs are calculated from the asset’s current value at $1.2526 (AToW).